Food52 is hoping that food lovers will make it their online home. The cuisine-meets-commerce portal announced several features today that will turn it into a social network for the culinary-inclined. "We think its necessary because food and cooking are inherently social," co-founder and CEO Amanda Hesser said. Aspiring top chefs and bakers can now create Food52 collections that allow them to save articles, recipes and products from its online retail space Provisions. Similar to Pinterest, users will be able to group items under a customized header. 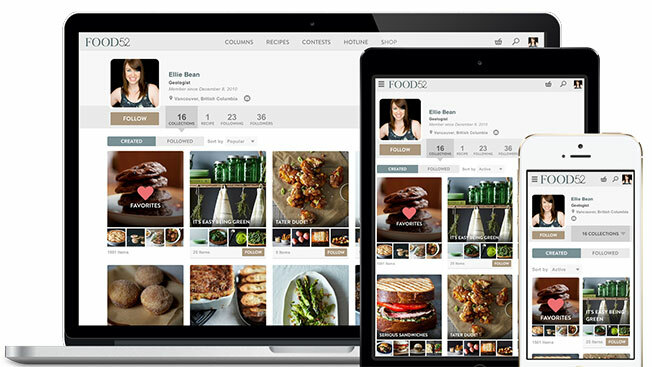 But, taking things one step further, users will also be able to peek into other people's collections, turning the personal filing system into an online foodie profile. If you follow users and decide to subscribe to the weekly email digest, you'll see how many of your friends like the same recipe and what's cooking in their kitchens based on their activity. Hesser, who was formerly the food editor at the New York Times Magazine, started Food52 with Le Cordon Bleu-trained chef Merrill Stubbs. The two women had met after working on The Essential New York Times Cookbook in 2010, and realized there wasn't a digital company that combined recipes with the ease of online commerce. "We felt as people who are passionate about food and cooking that there wasn't one place online for cooking life that would show you everything from great trustworthy recipes to beautiful products to new table linens to a social experience around food," Hesser explained. "We wanted a high-quality place where you could discover high-quality content." Hesser wanted the site to be a one-stop shop for those who loved cooking. She wanted a dinner party host to be able to go to Food 52 to watch videos on how to create recipes for friends, to directly buy the kitchen utensils necessary to prepare such dishes and to post questions in order to get other host's advice. The site has resonated with the online foodie crowd. More than 75 percent of its content is crowd-sourced, and the rest is created by an in-house editorial team. Food52 has also worked with brands like Ghiradelli, Electrolux and Fillippo Berio for native content and contests. "We are [taking] the offline experience that people have in their lives with food and bringing that online," she stated.